Some time ago Valiant announced they would have variant covers that looked like actual CGC-graded and slabbed comics. 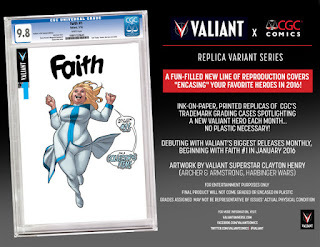 It almost looks like a swipe at the CGC but they actually partnered for them. I of course have mixed views on the CGC but it is funny to see some comics give the company a bit of a ribbing. This did make me wonder if when someone tries to get these graded it would cause some confusion, however. In Case You Forgot, Libraries Are Awesome! Project: Comic-Con 2015 is Almost Here!